Mission Moments: An Uneventful Week . . . NOT! An Uneventful Week . . . NOT! It has been an uneventful week . . . NOT! I wish I could say it was Dutch oven cooking, but, alas, I cannot. We put some blueberries on the stove with some water to rehydrate for some goodies Sister Bodell was going to make for district meeting today. We got busy and forgot about them. The good news is that the smoke detector works fine. The bad news is that the house smells like a campfire. What was I said at the end of last week's blog? Something about what new adventure waits for us in the coming week. We were definitely off to a good start. 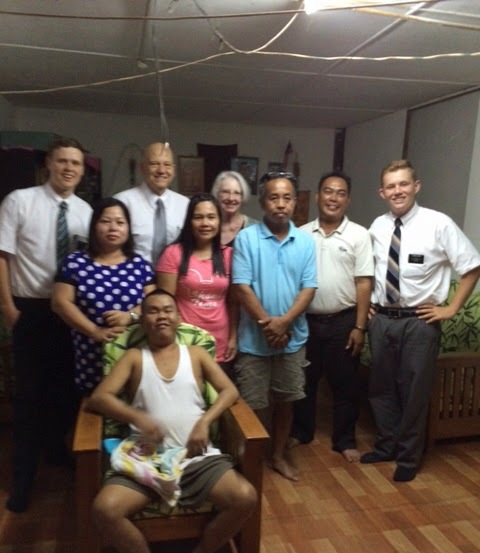 This week we also went to Sister Daisy's new home with Elders L & S. They wanted to make sure we knew where she lives. Elder S will be going home soon, and Elder L may be transferred. We had a really nice meal of chicken curry which was unique in flavor to what we've had thus far. This had a lemony flavor because it had lemon grass in it. Quite tasty, but still spicy. We also had something that resembled spinach, but it could have been some sort of greenery plucked from the roadside. It still tasted okay. The week continued Thursday evening with a dinner at Sister Sabie's place. It was a commemoration dinner for her son who was killed two months ago. There were lots of people there including eight missionaries. Sister Sabie had plenty of food for all the people that were there. The place was wall to wall with people sitting on the floor. Wall to Wall People, and you can't see the ones sitting on the left. There were twice this many in the other room! Yes, that's Elders L and S.
Sister Sabie made the best vegetable with carrots, cucumber, & spices. I don't know how it happened exactly, but Thursday evening, after we got home from Sister Sabies, Sister Bodell was getting a drink at the sink and the faucet broke. It just snapped off where the water filter was connected. We called President Chua Friday morning. He came over to see what he could do. He went out looking for parts. Sister Bodell and I went out also to see what we could find. While we were out, we had a near collision with a car that pulled right out in front of me. I slammed on the brakes and the horn at the same time! I couldn't steer to the other side of the road because there was a lady coming the opposite direction on her moto. She had a big smile on her face as she passed by. She thought the near disaster was pretty humorous! I could see the accident happening in my mind, but we were blessed with protection! I am grateful for that, but I was also grateful to get back home. I did go out later with Elders L & S again in the afternoon. We went to see Alexson and have a reading lesson. It's Alexson's mother that was making the beaded collar that I shared in a previous post. Here is Elder L wearing the finished product. This has got to be the best picture of Elder L.
He's usually pulling some weird face. Oh, before I forget, we missed our Skype lesson with our tutor this week. The power went out in the morning so we had no internet! Just one more thing this week. We had to text him to tell him the problem. We're glad he has an iPhone! We tried to FaceTime, but the connection for that was bad as well. 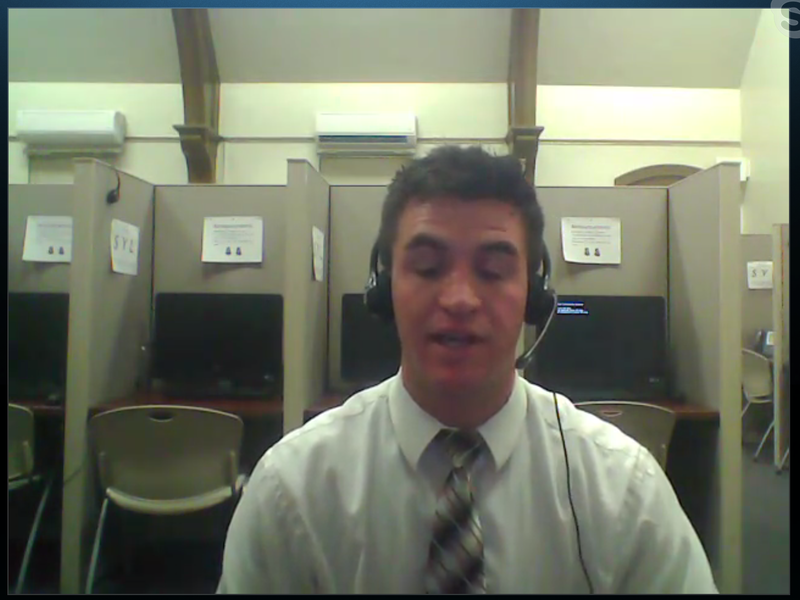 We had our six-month in-field Skype meeting Friday morning with Brother Thorley from the MTC. Six months is all we really get for language training, but due to some mitigating factors, we get another two months of language study with Micah. We had our last Skype coaching session with Bryan Friday morning as well. It was really hard to say good-bye. However, we hope to see him when we get home in March. We will miss him. He's a good man and a good friend. Great Screen Shot of Bryan. We love you! Saturday morning we had the district over for breakfast, prior to watching the Priesthood session of General Conference in English. They wanted to watch it in English before watching it in Malay tomorrow after church. It's been a beautiful morning. We've been physically and spiritually fed. I'm always impressed when I watch the Elders watch conference. They have their notepads handy and listen with real intents. Standing to sing Hark, All Ye Nations, hear Heaven's Voice. There is a great comradeship among the Elders. It is a blessing for us to be able to associate with them. Sunday was the usual Primary Sharing Time for Sister Bodell. We also had our second class of music directing for Branch One. That class consisted of President Gara and his family. The Branch Two choir had their debut in Sacrament meeting today singing, Come, O Thou King of Kings. It was amazing. There were about 20 that sang in the choir. I wish I had a recording of it. However, we did make a recording of Dearest Children during their choir practice this afternoon. Hopefully you can play the recording by copying and pasting this link in your browser. You have to keep in mind that this was only a practice. The altos are closest to the microphone (my iPhone). But, you can almost hear all four parts. That's something unheard of here in the Iban culture. We had an amazing turnout for practice today. Besides the usual, we also had an investigator family of five come; plus another investigator from another family. Speaking of investigators, Elders C and P had 12 investigators attend church today! There were 17 al together from all the missionaries. That is a lot. Many of them stayed to listen to the Priesthood/Relief Society sessions of General Conference Sunday evening. One more thing to report to end the week: We "followed" Elders H and M to an investigator's home. She has a son that is blind and has kidney issues. Apparently the blindness is caused by the kidney issue. Just a funny little note on the side here, the terms "follow" and "send" are both used to take someone with you in your car. We don't take the Elders anywhere. We either follow them or send them! I will this week with this shot of the neighborhood. I took this from one of the apartments we were checking out for new housing for the Elders. Both were terrible, especially for the rent wanted. I thought about including the pictures I took of the insides of these places so you could see, but I changed my mind. I didn't want to make anyone ill. This is a good view of where we live. Next week is shaping up to be a big one. It's transfer week, and we know that two are leaving for sure to return home. Their time is up. We may also be visiting a long house on Monday.